The Morrison Government is unperturbed that Medecins Sans Frontieres has been ordered to cease treating Australia’s refugees on Nauru, despite the island being declared a humanitarian emergency by health professionals. PRIME MINISTER SCOTT MORRISION has announced that the Productivity Commission is to inquire and report on how mental disease affects the Australian economy. There are those who would prefer an inquiry into the plight of the victims and their families rather than the Government’s bottom line, but it must count as a positive. It suggests that mental illness is now regarded as a serious issue — at least in Australia. But not, it appears, for those whom our Christian Prime Minister incarcerates on Nauru. The impeccably credentialed international charity, Medecins Sans Frontieres (MSF), has been peremptorily instructed to cease treating Australia’s refugees on the island because the country’s autocratic leader says it is no longer necessary. And in his own appalling terms, President Baron Waqa is right, since Australia is clearly not interested in taking responsibility for the desperate men, women and children it has delivered to his clutches, why should he bother? Let them rot — as long, of course, as Australia pays him to let them do so. The distinguished lawyer, Geoffrey Watson, sees this as simply a cynical commercial arrangement — Waqa’s corrupt administration trousers $3,000 a month for every body delivered and the more of that can be retained as profit the better. Thus outsiders – and especially those with the special knowledge to know how broken the system has become – are decidedly unwelcome; the money boat must not be rocked. There is an alternative interpretation, which is that Waqa is simply being arrogant and petulant — a spoiled child screaming defiantly, it’s my toy and I can break it if I want to. If that is the case, it is up to the adults – the Australian Government – to point out, firstly, that we are not talking about toys but human beings and, secondly, that Australia put them there and sends the money to keep them there. We pay the piper and should be calling the tune. But Morrison replies with the robotic response that it has absolutely nothing to do with him, it is purely a matter for Nauru. Apart from being wrong in international law, this offends both common decency and common sense. This is sadistic cruelty of the highest magnitude. These ppl are seriously derranged. Any number of health professionals have explained the parlous effects of long-term detention, the hopelessness that leads to despair and self-harm. The immediate need not only for the palliative treatment MSF was able to provide but the far more effective, long-term, therapy available in Australia. But Morrison and his crew are unmoved. On the rare occasions when a patient’s condition is so dire a medical evacuation is authorised, it may or may not be in time to make a significant difference. 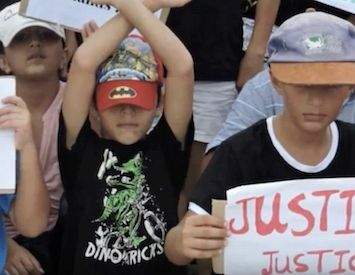 But whether it is or not, the "client" – as Morrison likes to call him or her – is sent straight back to Nauru to start the whole cycle of humiliation and degradation again. Waqa’s edict has done one useful thing: it has made it clear that our Government’s campaign of persecution and brutality is deliberate. Morrison has all the clout he needs to protest, to insist on providing at least marginally humane conditions, but has chosen not to. Like the priest and the Levite in the parable, Morrison the Pentecostalist has chosen to pass by on the other side. Worse, in fact: he has effectively sold innocent asylum seekers into slavery. And why not? At least the Old Testament part of his Bible allows it. No need for an inquiry there. hey @SydOperaHouse, i’d like to take out an ad on the opera house sails — a video projection of kids detained on #nauru, one of our national pastimes. i’m willing to pay the same as @NSW_Racing. serious offer — who do i speak with? Our shame on the treatment of refugees (men,women and children) on Nauru just got worse. Doctors Without Borders MSF have been kicked off the gulag. Is there no end to this cruelty?